Delivery of small molecules, proteins, cells, or appropriate devices in the models above via intracerebral, intrathecal, systemic, oral, or local administration, either by injection or continuous infusion. Single, multiple, or continuous dosing. Sensorimotor Function: limb placing tests, tail swing test, neurological severity scale, beam balance, spontaneous limb use, grid walking, staircase, sticky tape, paw reaching, rotorod, and rotating beam tests. Memory: novel object recognition, Morris water maze test, contextual fear conditioning. Other model-specific behavioral tests are also available. • Blood, urine, and CSF sampling for PK and PD studies. • Brain and other organ harvesting, fixation, sectioning, and routine histological processing. • Infarct volume analysis for stroke studies. 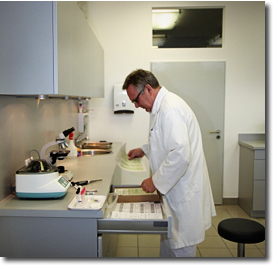 • Immunocytochemistry studies are done through special arrangement. Biotrofix provides preclinical contract research services, Preclinical Research, Preclinical Drug Discovery & Preclinical Drug Development for clients in the pharmaceutical and biotechnology industries, and represents the cutting edge of preclinical research today. Biotrofix is a premier preclinical contract research organization specializing in animal models of CNS, cardiac and vascular disease. With years of experience, both academic, commercial, clients throughout the biotech and pharmaceutical industries, Biotrofix delivers industry-leading preclinical CRO services, including rodent models of acute stroke and stroke recovery, preclinical CRO services for Alzheimer's Disease, transgenic animal models for ALS, as well as CRO services for brain injury, preclinical CRO services for spinal cord injury and related cardiac drug discovery and development.